Made without eggs, the skeins of “durum wheat pasta” are made solely of durum wheat flour and cold water mixed in the kneader. Rustichella d’Abruzzo pasta respects the canons of classic pasta production, with bronze dies and slow drying process, the dough extruded through the die, the large skein is cut into many strips through the skein maker. Once dehumidified, the skeins of pasta are ready to be dried. It takes about 20 hours to obtain perfumed skeins that unfold while cooking. Rustichella d’Abruzzo offers Fettuccine, Tagliatelle and Straccali, the “classic egg pasta shapes “ rigorously with no eggs, thin and light, ready to be cooked in few minutes. Tasty for everyone, even for those who are intolerant to eggs, without giving up on a plate of Tagliatelle ” alla Bolognese” and other Italian dishes, which rigorously require egg pasta shapes. 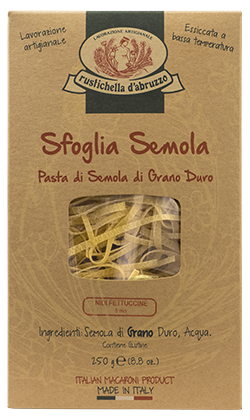 Originally from Bologna, these simple durum wheat semolina skeins (bronze-drawn and dried at low temperature), are made without eggs to satisfy also those who have specific intolerances. The sauce par excellence is the meat sauce "alla Bolognese", but this type combines well also with Rustichella d'Abruzzo "alla Genovese", "Tomato and Basil" and "Truffle" sauces. Cooking time: 5 minutes. 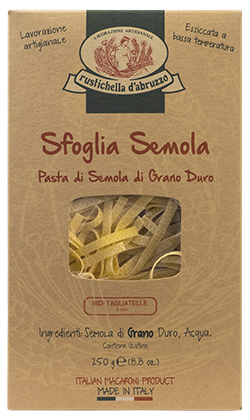 Originally from Bologna, these simple durum wheat semolina skeins (bronze-drawn and dried at low temperature), are made without eggs to satisfy also those who have specific intolerances. The sauce par excellence is "Boscaiola" but this type combines well also with Rustichella d'Abruzzo "Genovese", the "Ragù bianco ai Funghi Porcini" and "alla Salsiccia" sauces. Cooking time: 5 minutes.